May 1st is here, so let’s take a closer look at the May birthstone! 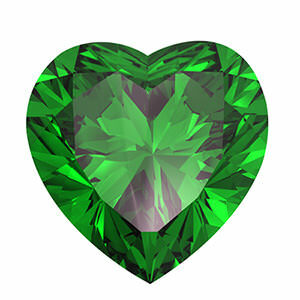 Emeralds are beryls and therefore are cousins to aquamarines, morganites, and others. The name emerald is derived from the Greek smaragdus, meaning green. Green is considered the color of growth, birth, rebirth, springtime, and fertility. Emeralds were said to give the wearer luck, prescience, and youth. It might have been those qualities, as well as the beauty of the gem, that prompted Cleopatra to wear emeralds and to claim ownership of every emerald mine in Egypt. Many Egyptian mummies were buried with an emerald to signify/ensure/regain eternal youth. As with all gemstones, emeralds will range from clear and stunning to opaque and, well, rock-looking. The Green Man carries tumbled emeralds, which are dark green with black inclusions. They feel smooth and soothing (to me, anyway) and are no less beautiful than the clear, faceted gemstone—just a different presentation in a more raw form. Famous emeralds include the one said to have fallen from Lucifer’s crown and made into the Grail. Then there’s the connection to the Emerald Tablet, said to contain the secrets of alchemy, the elements, the philosopher’s stone, and the relationship between microcosm and macrocosm.